The Muskrat Falls Project is a large-scale hydroelectric dam initiative undertaken by the province of Newfoundland and Labrador. A critical step in the process was the construction of a 377-feet (115-metre) long, 750-ton temporary bridge in the city of Goose Bay. The bridge, which is 52 feet (15.85 metres) wide and 30 feet (9.14 metres) high, is mainly used by vehicles known as off-highway trucks (such as the Caterpillar 773) to transport blasted rock. One truck carrying 111 tons of material can cross the bridge’s wooden deck while a second (empty) truck crosses in the opposite direction. The bridge was incrementally launched using a 261-feet (79.6-metre) launching nose with a truss section and a section of assembled girders. Temporary bridge erected for the Muskrat Falls hydroelectric project. One key challenge was to design a bridge of sufficient width and height to accommodate two off-highway trucks crossing the bridge side-by-side. While the truss option was more cost-effective due to span and weight capacity considerations, it meant the launching nose would require a truss section so it could be anchored to an existing launching nose made of conventional girders that Canam typically uses for its launched bridge projects. 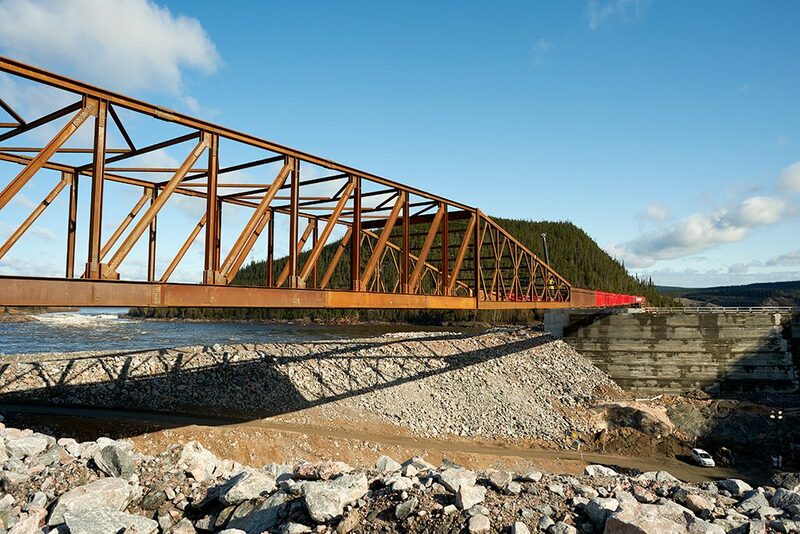 A conventional steel girder bridge erected in the province of Newfoundland and Labrador would also have been more expensive to transport when compared to the small-scale components of a truss bridge. The launching nose was 261 feet (79.6 metres) long. Built upstream from the dam, the bridge would have to be removed once the generating station project was completed, making a launched bridge—which could be erected and removed without cranes—doubly appealing. Bolted connections were used throughout the bridge, and particular attention was paid to the gusset plates to make erection easier for the structural-steel workers. 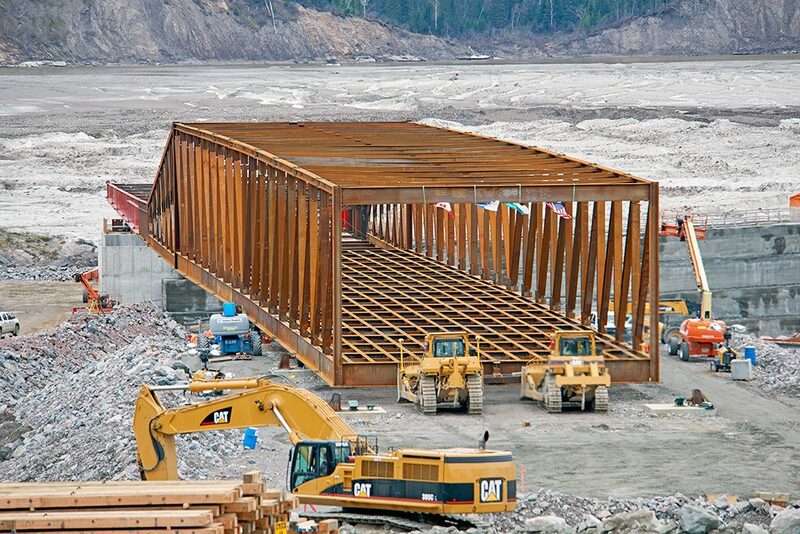 Canam-Bridges’ largest launched truss bridge to date. Canam’s mandate was to erect a cost-effective temporary bridge that would be serviceable throughout the project’s lifecycle and could be removed upon completion of the power station. With the added challenge of minimizing fabrication and installation costs, a launched truss bridge fit the bill.